Combing accomplishes what chemicals cannot; it enables families to be self-reliant, proactive, and preventive. Attention, parents: Protect your children from the potentially harmful pesticide-based shampoos and treatments that are commonly used to try to eliminate head lice. The National Pediculosis Association (NPA) is urging the U.S. Food and Drug Administration (FDA) to provide more details on safe alternative combing products. Parents who want to lend their support to the cause have until 11:59 pm Eastern Time Monday, August 6 to provide comments at https://www.regulations.gov/docket?D=FDA-2018-P-0599. In February, the NPA, a nonprofit organization protecting children and the environment from these pesticides, submitted the petition, which asks the FDA to feature well-designed nit-removal combs more prominently through its website and educational materials. Pesticide-based lice treatments are not only risky to a child’s health; they do not always kill all lice eggs (nits) and require combing in order to work. Pesticides also lead to negative consequences including treatment failure, chronic infestations, communicability of lice to others, lice resistance, pollution and other adverse impacts. Parents may have too much faith in them as a “quick fix” to get their children back to school. Ironically, though, these treatments can lead to classroom disruption when they repeatedly fail. The NPA developed the LiceMeister comb for the screening, detection and removal of lice and nits. The comb was specially featured as a chemical treatment alternative at a global meeting of the Stockholm Convention, and highlighted for being free of Persistent Organic Pollutants (POPs). For parents who believe that “nothing compares to the kindness of a comb,” the time to act for your children is now. Please reach out to the FDA today at https://www.regulations.gov/docket?D=FDA-2018-P-0599. The National Pediculosis Association (NPA) is a 501(c) 3 nonprofit organization dedicated to the mission of setting the highest possible public health standards for children as it relates to the communicability and treatment of head lice. The NPA is comprised of volunteers including its Scientific Advisory Board. 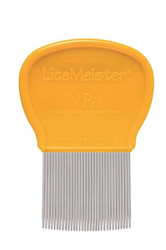 As part of its mission, the NPA developed the LiceMeister® comb and makes it available on its website, https://www.headlice.org/. All proceeds from the comb allow the NPA to maintain independence from product manufacturers and stay loyal to its mission to protect children from the misuse and abuse of pesticides for lice.